Hugh Daily, pictured, and Charles ‘Dazzy’ Vance, pictured above, threw no-hitters on this date. Charles “Dazzy” Vance threw a no-hitter for the Brooklyn Robins, 91 years ago today. The Hall of Famer beat Philadelphia 10-1 in the first game of a September 13, 1925 doubleheader at Ebbets Field while holding the Phillies to no hits. The Phillies scored their lone run on two Brooklyn errors and a sacrifice fly. The no-hitter actually completed 15⅔ consecutive no-hit innings for Vance, who threw a one-hit shutout against the same Phillies five days earlier. The only hit in the earlier game came with one out in the second inning. 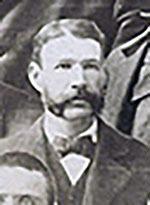 Vance was only able to extend his streak to an even 16 in his next start, as the Pittsburgh Pirates’ Max Carey reached base on a one-out bunt single in the first inning. Also throwing a no-hitter on this day in 1883 was Hugh Daily, the only no-hit pitcher born in Ireland.